_The story of the Humpback Whales is a success story. In 1966 after heavy exploitation Northern Pacific Humpbacks were estimated at 1,400. The current estimate is approx. 20,000. The Humpbacks that winter in the Hawaiian Islands migrate seasonally from Alaska, a 3600 mile trip that they complete in as few as 36 days. Feeding takes place in Alaska and mating and birthing happens in Hawaii. The male Humpbacks sing complex songs that can last up to 20 mins and can be heard 20 miles away. Although the singers have been found to be male it has not been proven that this has to do with mating behavior. The jury is still out on that one. All singers sing the same song each season until its changes the next season. It has been suggested that the last note of last seasons song is the first note of the next seasons song. This tumor turned out to be worse than it looked. 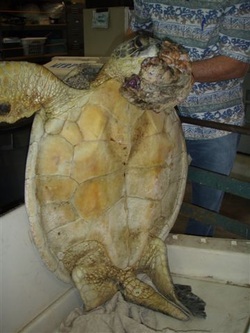 Although it weighed almost eight pounds it had not invaded basic facial and neck structures. 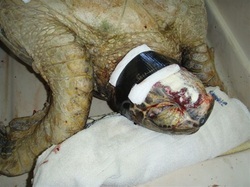 This turtle was flown to Oahu for the operation and then released back in Maui where it was captured.in November 2011 and has been sighted since.